Many of our clients are in need of winter cloths: winter coats, sweatshirt, winter boots,etc. As part of the York University Refugees Welcome Here! 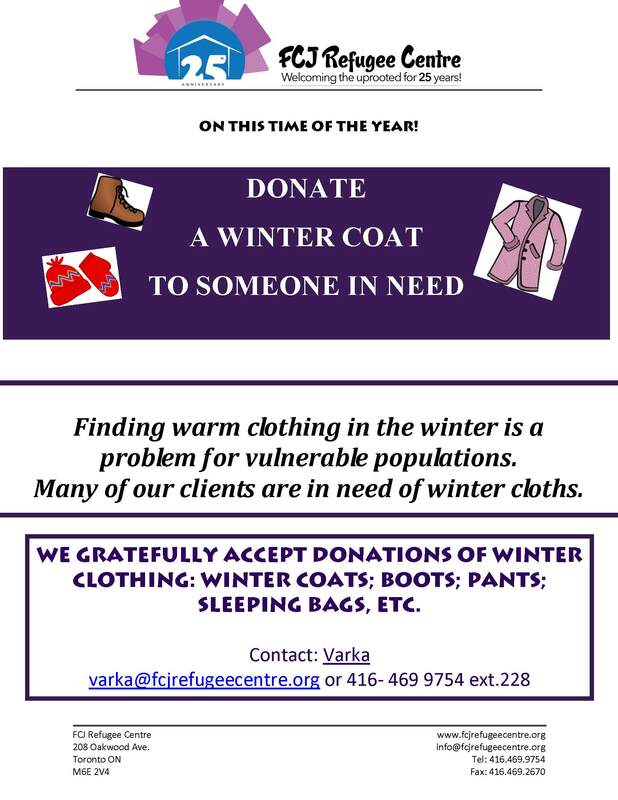 campaign we are collecting coats and winter clothing to support local immigrants and refugees at the FCJ Refugee Centre to (literally!) help give a warmer welcome to our community. We are also tabling to raise awareness of refugee issues and invite students to join this campaign. WUSC York – Keele, Amnesty International at York (AIY), York University Syria Response and Refugee Initiative and Islamic Relief at York University are collaborating and helping with the collection of these coats. Coats may be dropped off at Room 107, McLaughlin College OR McLaughlin College Council or when the respective organizations are tabling until December 5th. To join the Refugees Welcome Here! please contact us at refwelc@yorku.ca and fill in our questionairre at https://goo.gl/forms/IZwi7T9XSKuIhCA53 ! The York University Syria Response and Refugee Initiative is providing logistical support. Please visit our site at www.yorku.ca/refugees to learn more and to get involved! You can learn more about and follow the FCJ Refugee Centre at http://www.fcjrefugeecentre.org/ .